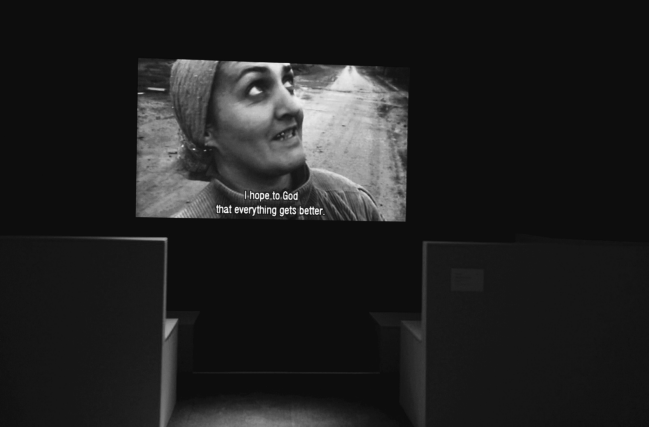 Film still from Episode 1, Renzo Martens (2003), installation at FACT (Foundation for Art and Creative Technology), Liverpool as part of My War (2010). Images courtesy of FACT. Today, we are in an intervallic period in which the great majority of people do not have a name. The only name available is ‘excluded’, which is the name of those who have no name. Of circumstance that still protects the place. Lives lived on the margins of social, political, cultural, economic and geographical borders are lives half lived. Denied access to legal, economic and political redress, these lives exist in a limbo-like state that is largely preoccupied with acquiring and sustaining the bare essentials of life. The refugee, the political prisoner, the disappeared, the ‘ghost detainee’, the victim of torture, the dispossessed, the silenced, all have been excluded, to different degrees, from the fraternity of the social sphere, appeal to the safety net of the nation state, and recourse to international law. They have been out-lawed, so to speak: placed beyond recourse to law and yet still occupying a more often than-not precarious relationship to the law. Although there is a significant degree of familiarity to be found in these sentiments, there is an increasingly notable move both in the political sciences and in cultural studies to view such subject positions not as the exception to modernity but its exemplification. Which brings us to a far more radical proposal: what if the fact of discrimination, in all its injustice and strategic forms of exclusion, is the point at which we fi nd not so much an imperfect modern subject — a subject existing in a ‘sub-modern’ phase that has yet to realize its full potential — as we do the sine qua non of modernity; its prerequisite as opposed to anomalous subject? What if the refugee, the political prisoner, the disappeared, the victim of torture, the ‘ghost detainee’, and the dispossessed are not only constitutive of modernity but its emblematic if not exemplary subjects? * This essay is a revised and extended version of ‘Zones of Indistinction: Giorgio Agamben’s “Bare Life” and the Politics of Aesthetics’, ( 2009 ) 98 Third Text 109–25, and ‘Camps (or, the Precarious Logic of Late-Modernity)’ ( 2011 ) 13 Fillip 38–47. Alain Badiou, ‘The caesura of nihilism’, Lecture delivered at the University of Essex, September 2003. J.H. Prynne, Force of Circumstance and Other Poems (London: Routledge 1962 ). Downey, Anthony. “Exemplary Subjects: Camps and the Politics of Representation.” Giorgio Agamben: Legal, Political and Philosophical Perspectives. Ed. Tom Frost. Oxon, UK: Routledge, 2013. 119-42.